The below article was published online by the Medical Chronicle on 8 October. The article was prepared by TAC’s Catherine Tomlinson and Marcus Low in response to criticism by IMSA of the Fix the Patent Laws campaign. The IMSA article is also published below. In an article that appeared in the September issue of Medical Chronicle and on the publication’s website, Val Beaumont of Innovative Medicines South Africa (IMSA) criticised a campaign lead by the Treatment Action Campaign (TAC) and Médecins Sans Frontières (MSF) to ‘fix the patent laws’ in SA. According to Beaumont, it is IMSA’s intention to ensure that ‘those who do not know the facts’ regarding intellectual property (IP) and the patent regimen are not ‘mislead’. We are writing to clarify some facts regarding IP protection in SA, and its impact on health. As a member of the World Trade Organization, SA is party to the Agreement on Trade Related Aspects of Intellectual Property (the TRIPS agreement). Signed in 1994, TRIPS seeks to harmonise IP regimens worldwide. The agreement allows for countries to use flexibilities that balance intellectual property protection with the protection of the public interest, and specifically public health. These flexibilities were re-asserted in the 2001 Doha Declaration on TRIPS and Public Health, in which member states affirmed that ‘the agreement can and should be interpreted and implemented in a manner supportive of WTO members’ right to protect public health and, in particular, to promote access to medicines for all’. Many developing countries including India, Brazil, Thailand and Argentina have taken pro­active steps to protect public health by writing key flexibilities into their national laws. Yet, a decade after the Doha Declaration, and despite facing dual HIV and TB epidemics, and a burgeoning epidemic of noncommunicable diseases, SA still has to do so. Let’s consider the potential impact of such flexibilities. SA currently does not substantively examine applications before patents are granted, instead hosting a registry system in which patents are given simply if administrative requirements are met. As such, SA grants an excessively high number of patents: the country granted 2442 pharmaceutical patents in 2008 alone, while Brazil only granted 273 between 2003 and 2008 (Correa, 2011). This excessive patenting is further promoted by the country’s patent standards, which do not explicitly exclude new forms or uses of old medicines. This means that patent applications for even small changes on existing medicines are granted, and could result in another 20-year patent period on top of the initial 20-year period, blocking the entry of generic medicines and keeping prices high. By contrast, Indian patent law specifically blocks this process of ‘evergreening’ by prohibiting new uses and new formulations of existing medicines from receiving patents, unless there is significant improvement in therapeutic efficacy. As a result, many medicines that are patented in SA are not patented in India, including key cancer, asthma and TB medicines. The pre-eminent medical journal The Lancet and a recently released report from the United Nations Commission on Human Rights and the Law have both asserted that the relevant provisions in India’s law (Section 3d) are consistent with TRIPS. Argentina has recently followed suit by issuing guidelines that instruct patent examiners to reject new use, new form, and new formulation patents, with some exceptions. While the Medical Chronicle article claims that strengthening patent standards in SA would endanger innovation, new medicine development, and the bringing of new medicines to market, there is no evidence to suggest this is true. India, arguably the country with the most stringent patentability criteria, is flooded with new patent applications for innovative medicines and is seen as a prime emerging market for pharmaceutical companies. We are not aware of a single case in which an innovative medicine that is available in SA is not available in India. Conversely, however, we have myriad examples of affordable, generic medicines being available in India’s market, but inaccessible in the South African context – particularly the public sector – because of price. Instead of curbing innovative medicines, enacting similar legislation in SA would not only help to reduce medicine prices, but would also ensure that only truly new and innovative medicines are granted patents. SA should also take advantage of other key flexibilities, including those relating to compulsory licenses, which allow for a government to override a patent. Each government is free to determine, with some guidelines, when and how a compulsory license is used. While SA’s law does allow for compulsory licenses, the terms and procedures for granting these licenses are overly restrictive. As such, the country has never granted a compulsory license for a pharmaceutical product. By contrast, a number of other developing countries have streamlined their legislation and utilised compulsory licenses in order to promote access to affordable medicines. With the impending roll-out of NHI, SA cannot continue to pay exorbitant prices for medicines. It is more important now than ever for the country to take advantage of key flexibilities allowed under international law, to ensure access to affordable medicine and promote equitable healthcare for all. Are SA’s Intellectual Property Laws an Obstacle to Cheaper Medicine? The worldwide call for cheap medicines to counter the burden of disease in developing nations is gathering momentum, and SA is no exception. As the government prepares to amend its patent laws, activist groups like the TAC and others have been lobbying intensively to gain public support for their campaign to change specific aspects of the law that prevent the production and importation of cheap generics. 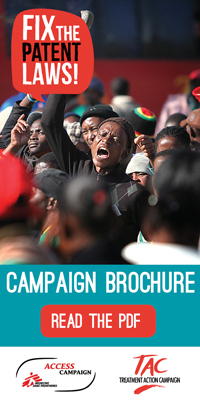 TAC’s crusade is embodied in a campaign called Fix the Patent Laws and is based on the premise that SA provides intellectual property (IP) protection beyond what is required in international law and that patents keep prices of medicines high and out of reach of the poor. 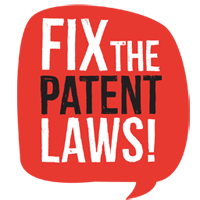 The Fix the Patent Laws website chronicles the TAC’s activities in this area, which range from sending out letters of advocacy, to handing out pamphlets, to organising public demonstrations and intervening in pharmaceutical patent-related court cases. It achieved a victory recently, when the Supreme Court of Appeals confirmed that public interest concerns are relevant in determining interim interdicts in patent cases. Innovative Medicines of SA (IMSA) has conducted an analysis of international IP law and SA law to assess the validity of statements made and positions held by TAC and other lobbyists, such as Médecins Sans Frontières. “Our motivation was to ensure that conversations around innovation and the patent regimen reflect the facts and do not mislead those who are not familiar with the facts,” said Val Beaumont, IMSA’s executive director. Since 1994, protection of IP within countries has been governed by Agreement on Trade Related Aspects of IP Rights (TRIPS). In 2001, developing countries, concerned that developed countries were insisting on an overly narrow reading of TRIPS, initiated a round of talks focusing on access to affordable medicines, which resulted in the Doha Declaration. The declaration was aimed at ensuring that patents do not undermine the ability of countries to achieve the right to health, and made it possible for governments, among others, to issue compulsory licences on patents for medicines in case of emergencies. According to Beaumont, contrary to TAC’s claims, SA patent law is sufficiently TRIPS-compliant and offers the required flexibility within international IP laws and the Doha Declaration to the extent that SA is not compromised by the law as it currently stands. The SA Patents Act requires that the invention must have absolute novelty, inventive merit and industrial applicability, which is in line with TRIPS. The TAC is asking that SA law be amended to introduce substantive examination of patents before registration. According to IMSA, this would increase the current examination time of 18 months to three years or more, and would require skilled and costly manpower, two resources that are already causing delays in the process. Examination of outcomes in any other country where the medicine is patented can, in any event, also be relied upon in the current system, to attack SA patents and show invalidity, if that was a concern. More worrying, according to IMSA, is the TAC’s hope for SA to implement an equivalent of the Indian Patents Act S.3(d), which includes a list of nonpatentables such as the medicinal use of new forms of a known substance unless there is a significant difference in properties. The SA Patents Act currently permits the patenting of a new medicinal use of a known substance, provided such new use complies with the requirements of novelty and inventiveness. IP protection advocates believe that the downgrading of patentability will significantly undermine innovation and will serve to scare off potential patent-seekers of medicines that SA may desperately need. The TRIPS agreement permits national laws to provide for compulsory licensing and to adopt special measures, including compulsory licensing (CL), to protect public health under certain terms and conditions. The TAC is calling for simplified CL provisions and further, for the specific double-licensing provisions to be included with regard to medicines. This will have TRIPS implications, Beaumont believes: TRIPS prescribes specific requirements for CLs, while SA has to have insufficient manufacturing ability to qualify for the double-licensing model. “IMSA has always supported provision for issuing of CLs, where necessary, for public health emergencies,” said Beaumont. “SA, however, has a well-developed pharmaceutical hub with a strong local medicines manufacturing base that also exports medicines. It therefore does not fall into the category of a country envisaged by the Doha Declaration, which allows for countries with no manufacturing capability to apply for an import CL to enable another country to manufacture and export to them. “If SA were to import medicines under a CL, it would also undermine local pharmaceutical capacity,” she added. A concession called the Bolar provision allows for generic producers to obtain early marketing authorisation to enable them to market and manu­facture their goods as soon as the patent expires. “Our generics medicines manufacturers currently enjoy two important and beneficial concessions,” said Beaumont. “They are permitted to prepare for, to apply for and get marketing registration of a medicine within the patent protection period. Although no stockpiling of manufactured products is permitted during the term of the patent, the generics manufacturers are empowered to start manufacturing and marketing immediately after the patent expires. The fact that there is no data exclusivity in SA means that the country currently is not compliant with a mandatory international norm contained in TRIPS. Currently, therefore, IP is only protected if it is linked to a patent. “Although there is a secrecy provision in the Medicines Act that data may not be disclosed, there is no mechanism to enforce that; and our information is that secrecy is, in fact, not preserved,” said Beaumont. The TAC opposes introduction of data protection provisions in the coming changes to the Patents Act. The TAC is lobbying for inclusion of parallel importation in the Patents Act and easy access to importation rights, which is not a requirement of TRIPS. However, SA already provides for parallel importation in the Medicines Act, which details procedures for parallel imports. The TRIPS agreement recognises that anticompetitive practices may occur in some voluntary licences granted by patent holders; and these should be controlled. SA also has a proactive competition authority that guards against anti­competitive practices. Voluntary licensing works well in most cases, the low price of antiretroviral drugs in SA being a good example; a fact not acknowledged by the TAC.